Jennifer Paganelli Sunny Isle has arrived! We are thrilled to say Sunny Isle from Jennifer Paganelli (Free Spirit Fabrics) is now in stock! 18 gorgeous prints now available in the UK. Its bold bright and cheerful and we love it. We were so honored to take part in the launch of this collection and you may have seen many photos of our progress over the last few months. The result being that June’s edition of Today’s Quilter will feature our quilt so go out and buy buy buy this wonderful magazine and dream of tropical paradise. Sunny Isle can be any island, maybe your favorite that conjures up relaxation and well-being. The sand, water, pool, flip-flops, the striped umbrellas – it all adds to our experience of heaven on earth. Islands are those places that give us momentary pause and helps us shift our priorities and give us new perspective. An island, like our fabrics, give you that ability to unwind. Fabrics elicit the emotion of happiness and help us escape to far-away places. Sunny Isles is the happy place you dream of…wind-blown hair, lots of suntan oil, sand in bathing suits and buckets of sea urchins collected. These are the days that made up my childhood and the place I call home. Our theme this month is Be vibrant! 2. (of colour) bright and striking. Energy is all around us! Let’s embrace colour and become vibrant! To help celebrate the launch we also now stock Sis Boom dress patterns. This is a pdf copy that is emailed to you. What great fun to see this fabric and the designer intended! So get out there and sew in colour! Hotel Fredericksted hits the press! We couldn’t be more thrilled to hear Jo Avery (My Bear Paw) has yet another amazing quilt in Today’s Quilter. She’s used the fabulous Hotel Frederiksted from Jennifer Paganelli (Free Spirit Fabrics). I’m Jo Avery, and this blog is all about sharing the things I make. 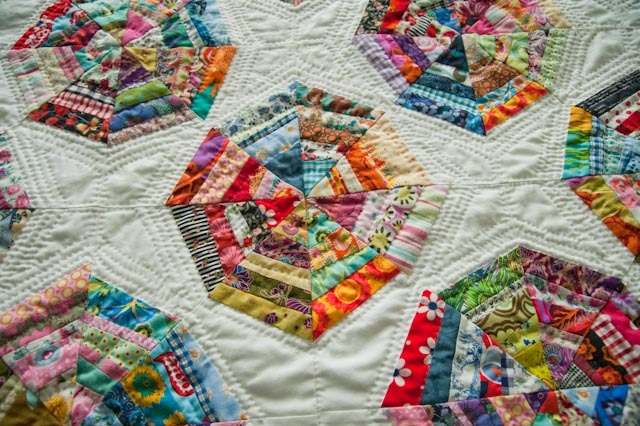 My sister, Jane, taught me to sew when I was 6 years old (a squirrel made out of our old curtains), and I spent a large part of my childhood making toys, knitting, and from the age of 10, English paper piecing with hexagons (though I just called it patchwork then!). When I was 21 I decided to start my own business designing and producing tapestry kits. I didn’t really know what I was doing but with the help of my boyfriend, Jonathan, (who knew a bit more than me) it worked and Cleopatra’s Needle was born. After a couple of years we moved from London to the Scottish Borders. We married and had 2 boys. I spent less time running the business so it was left to Jonathan to take the reigns, and though it was still going well, it wasn’t really what he wanted to do. So we sold it (it is still going strong under new ownership) and Jonathan set up a furniture making business (called Jonathan Avery). Meanwhile I had joined the local quilt group and started making quilts for friends and family. Soon I was making art quilts and exhibiting them in galleries all over the world. In 2011 I opened up a craft studio in our Edinburgh store, which I named myBearpaw, and have been teaching workshops in sewing, quilting, embroidery and crochet ever since. Color Brigade by Jennifer Paganelli now in! At last we can show off the gorgeous colours of Jennifer Paganelli’s new collection Color Brigade! The big bold florals and rich colours are Jennifer at her best. There is limited stock so grab your JP while its here. Happy is the moniker of this lovely selection. Large florals with deep colored backgrounds lay the foundation for this strong Island vibe that once again has that “take me away” vacation vibe. Having grown up in the Virgin Islands and embracing the world of mismatched pattern on all the lovely people that resided there is where the foundation for my textiles begins. Layers of different cloths and head wraps are the origins of my homeland and the cruzan culture of my sensibility. Textiles played a huge roll in my early aesthetic development. These florals come alive with the saturated colors of Sis Boom. Coordinates and color mixed with these florals or the huge Fluer de lis and this wonderful check will look as though you threw it all together when in actuality there is a color harmony that keeps the fluidity intact. Two toned wood cuts, and rhythmic lines keep it all cohesive. I can see amazing quilts and gorgeous dresses and products crafted from these amazing designs. Cabanas and beach umbrellas dot the beaches, and the bathing suits and trunks all cohabit here to bring you another resort vibe from none other than me. WOW – time to put our feet up! After 3 big shows in 3 months its time for a well deserved rest on the show circuit. We just have the market night to go on the 3rd July 7:30-9 on Facebook so log in and join in on the great sell off of our remnants! We’re busy ordering for the Autumn and pleased to tell you there will be MORE Amy Butler as we welcome the new range of Eternal Sunshine. It will slot in nicely with Dreamweaver carrying the great trademark blues and greens with some of the deeper wine colours for the autumn. Oh and did I mention BIG roses – ooooh yes, big bright roses! SWOOOON. We have got Flo’s florals coming in July from Lewis & Irene and Dove house and Harbourside in August. So new ranges from them as well – which will be just in time as we are running low on stock now! We’re working on getting some Jennifer Paganelli – so watch this space, fingers crossed, soooooon.